Many adolescents do not look forward to wearing braces. This initiation into the teen years may feel like a prison sentence for some, who envision missing out on the enjoyment of popcorn, pizza, candy, and all the tasty treats common among their peers. Invisalign Teen, however, has changed the course of orthodontia for many young people. And your teen could be a candidate for this revolutionary treatment. Can Invisalign Really Work for My Teen? 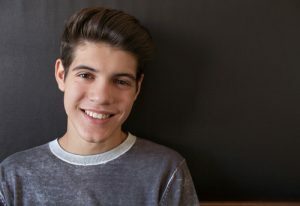 It may seem like your teen’s alignment issues are too severe for Invisalign to be a viable option, but Invisalign can correct the same problems as conventional metal braces, including overbites, underbites, open bites, gapped teeth, and crowded teeth. For the teens who underwent interceptive orthodontics as children, Invisalign may be a more likely solution because they underwent early intervention for jaw growth, making them a good candidate for clear aligners. It’s important to be open to various types of youth braces, and to remember that every type of orthodontia has the same end goal: to create an aligned smile that is comfortable, functional, and creates the foundation for good oral health for life. Even if Invisalign isn’t an option, clear brackets can be a discreet teeth-straightening option. Not quite as minimal as Invisalign but, for many teens, far preferable to metal braces. Is My Teen Responsible Enough to Wear Invisalign? You know your teen best, but just because they never clean their room, refuse to hang up their clothes, and can’t get their eyes off their smartphone, that doesn’t mean they’re incapable of following the rules of Invisalign. In fact, the markers of Invisalign have found that teens are often more diligent about wearing their nearly invisible aligners than adults. Wouldn’t you be motivated to follow the rules when, after a year or so of no one realizing you have braces, the reward is straight, flawless teeth? In case your teen is likely to slack on their adherence to the system of Invisalign, there is a built-in “we’re watching you” mechanism so cheating is unlikely to be successful. Small blue dots known as “wear indicators” are built into every aligner. These dots fade over time if the aligners are worn as instructed. Make a teen less self-conscious. Require fewer visits to their Center City Invisalign provider. Be less painful than the brackets and wires of traditional metal braces. Make your appointment at Roberts & De Marsche in our Center City, Philadelphia or Lawrenceville, NJ, office and find out more about Invisalign Teen. By giving them the opportunity to have straight, beautiful teeth, you get your teen on the road to a lifetime of good oral health. Can Wisdom Teeth Ruin Youth Braces?